Adjusting garage door openers is needed when the door does not close properly. Different units will have adjustment screws in different locations. Does the door close all right, but not open? Two things you can check. First make sure you do not have a broken spring. Examine the springs and make sure that they are still in good condition. Do you have a broken spring? Go to the article 'Garage Door Spring Repair' for information on what to do. Use caution when working on a door with a broken spring. The springs are OK? Good, see the information below on other adjustments. The behaviour of a door with improper force is very similar to a door that has the wrong settings on the limit switches. The limit switches set the travel of the door, both up and down. Force adjusments compensate for the weight of the door. 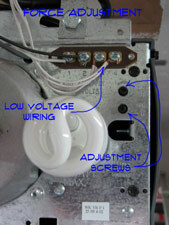 See the article 'Adjusting Garage Door Opener Limit Switches' for information on adjusting the travel. There are force adjustment screws on the back of the garage door opener unit. There are two screws, one for the closing pressure and the other for the opening pressure. If the opener is not picking up the door properly, adjust the opening pressure until the door lifts smoothly. If the door fails to close properly, you want to adjust the closing pressure. A word of caution about adjusting door pressure. There are safety features built into the closer to keep it from crushing a pet or a child. Adjusting the force to compensate for a door that is binding is dangerous. Make sure the door is working smoothly prior to making any force adjustments. Dig out the manual or obtain one for your garage door opener. Adjust the force adjustment screw per the directions in the manual. The screws are fairly sensitive so it should not take to much adjusment to get the door to close properly. The limit switches on a garage door opener set the travel of the door. This prevents the door from stretching the springs too much. When the door closes, the opener needs to shut off when the door is seated correctly. For instructions on setting the limit switches, see the article 'Adjusting Garage Door Limit Switches'. If the sensors are misaligned, the door will not close properly. The sensors are a safety feature that make sure there are no pets or children in the way when the door is closting. For instructions on adjusting the sensors, see the article 'Adjusting Garage Door Sensors'.